Its a Monday & so why not make it a Manicure Monday as PBBC announced lately that Monday will be all about sharing Nail related posts.Its not necessary that it should be a new post.It can be a Blast from the Past too.But in my case today I am presenting a brand new post! The good thing about tiny nail colors is that they hold sufficient product that does not end up drying up like those normal sized bottles that we only use couple of times and forget.They then keep lying there in our stash of many other nail lacquers waiting to be put on again! 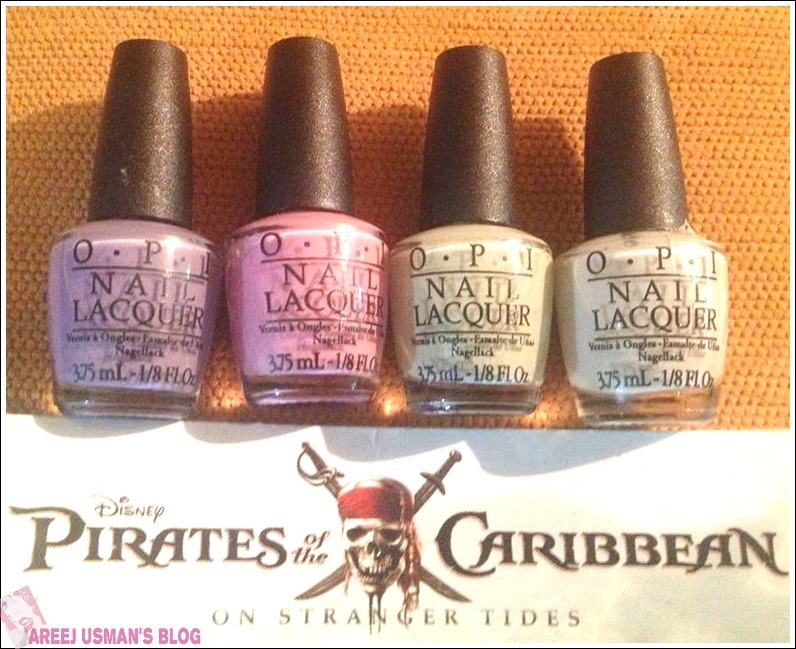 Recently I got a chance to shop from Daraz.pk & seeing the OPI minis collecction so readily available I ordered these.I am a big fan of Disney movies and Jack Sparrow of course. The mini bottle contains 3.75 ml of color compared to the huge 15ml regular sized bottle. 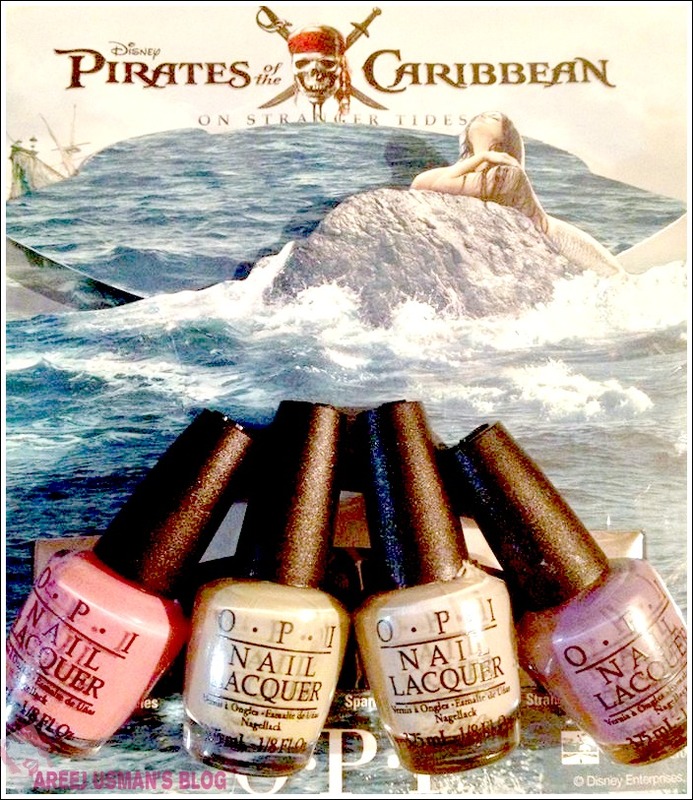 “Get your sword and parrot ready for some swashbuckling style with the creation of OPI’s Pirates of the Caribbean: On Stranger Tides inspired nail lacquers featuring limited edition cool pastel lacquer shades. This Mini set contains 4 3.75 ml bottles. The packaging is really cute.These are a true miniature of the original OPI standard bottle.The only thing that is not right is the small brush that doesn’t hold enough product for one decent application.Otherwise there is nothing wrong to own this collection and satisfying your lust for more OPI’s.They come in a very chic box that is also perfect for gifting to someone. 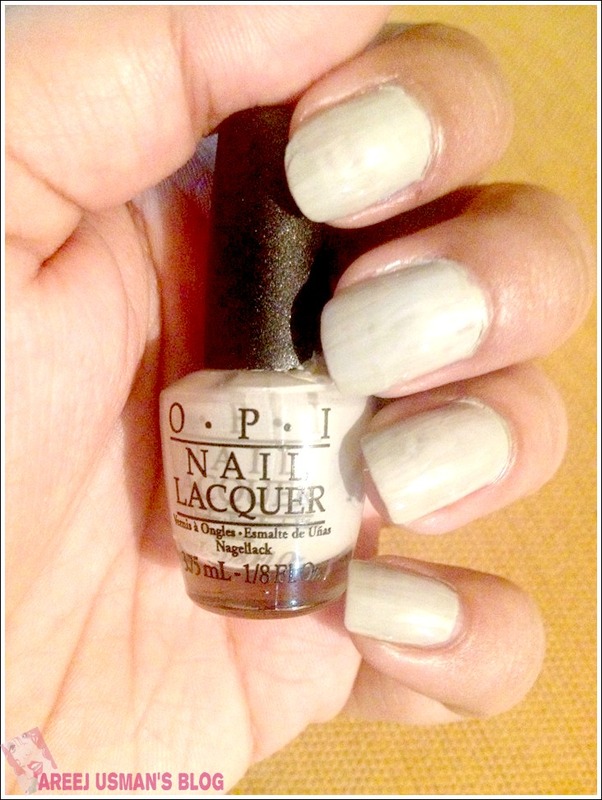 Its my top favourite among all.I have it on my nails at the moment too.Its a lovely dull grey with shades of beige.I have applied two coats of the nail color.Though this nail color felt sheer but only 2 coats did a great job.It appears less greyish in the pictures may be due to the yellow light in the room.Its also very closer to the shade Stranger Tides in the same collection.One can’t work it out at first.Moreover the bottles also appear the same. My second favourite among the bunch.Its a pastel lilac shade that I really like.It appears darker on the nails than in the bottle.2 coats are applied in the swatch. I am not a fan of light pinks.They make my hands look darker than usual.This is the perfect strawberry ice cream shade.Though I like it but still it isn’t going to be in my wearable shades.2 coats of the nail lacquer are applied in the swatch. The perfect pistachio green.This is the too much like Skull and Glossbones.They trick you in appearing one.I love this one too.2 coats of nail color applied.In all 4 nail colors this is the sheerest when 2 coats are applied.Can you have a glimpse of my nails! 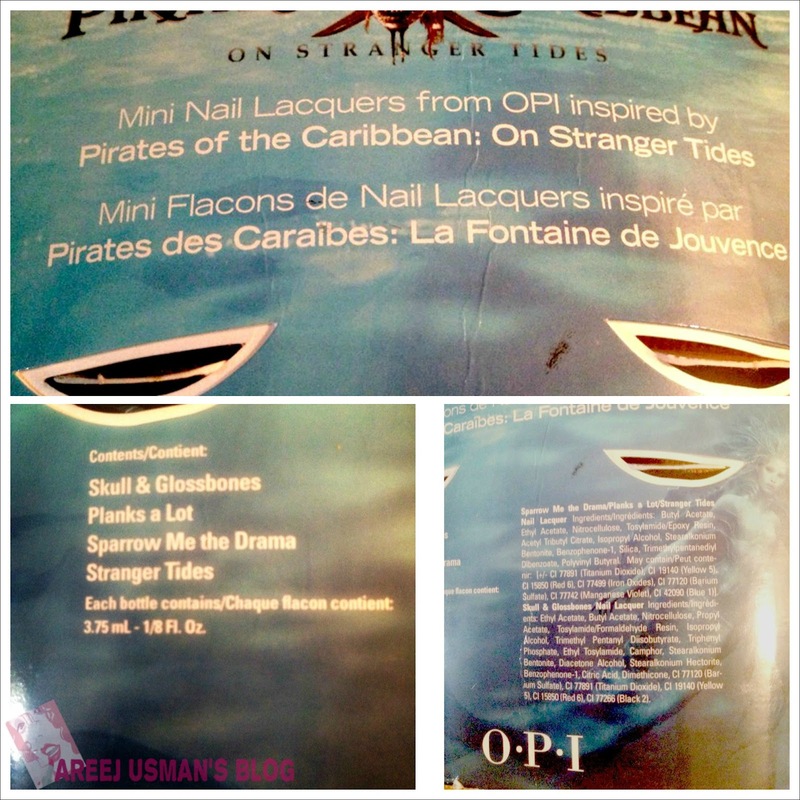 Overall I really like the OPI mini collection.All are pastel shades and do well in the fall and winters. 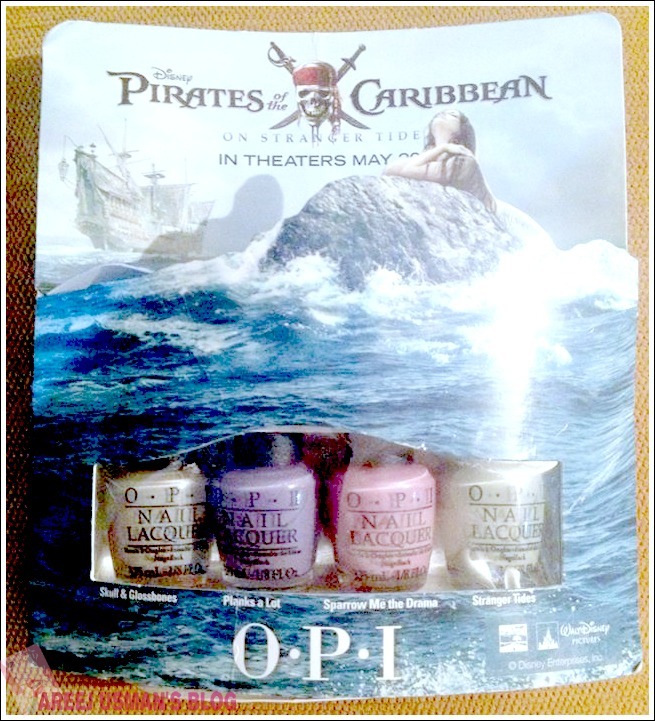 I would recommened the girls out there to get the mini collections.It may sound expensive when I say 1400 PRS for 4 3.75 ml nail lacquers.But the good thing abt mini collections is that you get 4 OPI shades for yourself.If you buy 4 regular OPI shades it may cost you around 32,00 PRS.So,why not get 4 shades for 1400!There is also a huge variety to choose from. To order in Pakistan,check out Daraz.pk,Just4girls.pk & Beauty Arena. Discount is available when you shop at Daraz.pk.Order this or any other item,enter AREEJUSMAN at checkout & get an instant 10% off on your purchase. 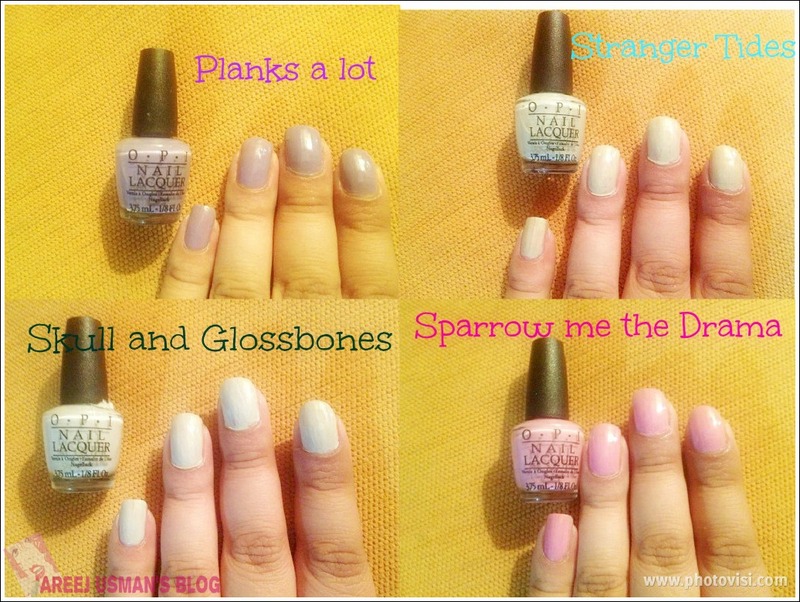 Do you like OPI?You love brights or pastels?